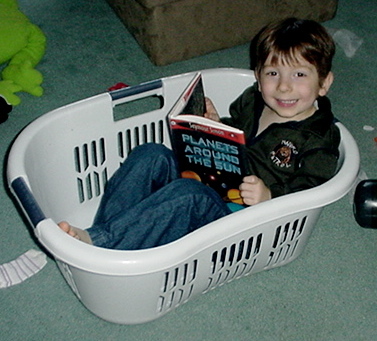 One of my twins around the age of 4 happily reading about the Solar System in a laundry basket. This could potentially be a pretty long post – but I wanted to share some books that would work well with the BYL Level 1 and BYL Level 2 programs. I scoured my own personal bookshelves, as well as my town library and Amazon, to provide you with a list of great books for your children to enjoy. There is a lot of “twaddle” out there for early readers, but there are also some real gems to be found. As reading abilities at this age vary so greatly, I will try to divide up the lists by reading level, without trying to label the books with “grade” levels. By beginning reader – I mean just starting to sound out cvc words. My favorite place to start is Bob Books, Set 1: Beginning Readers . These are very simple little stories and are just right for the child just beginning to read. Since each book is only a few pages long, it’s very satisfying for a new reader to read a “whole” book. This is the stage where they’re still building confidence in their reading. The above books are too easy, but they’re not quite ready for chapter books yet. This list get’s more advanced towards the bottom. There are more than enough books here to get you started – many of the chapter books are series. Beginning readers tend to love reading a series of books. There is something about really getting to know a set of characters and sticking with them book after book. While some might consider things like Magic Tree House as twaddle, I think they are great for getting children started in reading, especially if you offer them plenty of other choices as well. As far as a reading schedule goes – there isn’t any specific order in which to read these – some would be better with Level 1 while others are more suited to Level 2. Many can go with either – depending on your child’s reading level. Aim for very early readers to read aloud to you for at least 10 – 15 minutes a day. This may mean they only read a few pages of a reader, but a full chapter or even a whole book will soon be possible. Build up to 30 minutes of reading time every day, eventually reading silently. Having them read aloud is very important, even once they become comfortable, as you want to be sure they are pronouncing words correctly, enunciating, and reading with fluency. It is good practice for public speaking as well. I hope this list proves to be helpful to you. It is important to instill a love of reading in young children, so go gently in assigning these books. If they adore Frog and Toad, it’s OK if that’s all they read for a month straight. Re-reading is totally acceptable! Your goal is to get them to enjoy reading, so let them have some freedom in their choices. There is plenty of time later for assigned reading. Just what I wanted! Thanks a bunch!